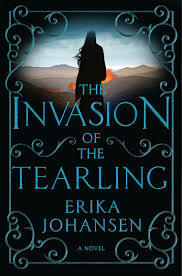 In this second installment, sequel to the Erika Johansen’s “Queen of the Tearling”, tensions build as the Red Queen begins her invasion of Tear, while court and church politics swirl as Tear prepares for her army’s arrival. Among several new characters, a new mystery man, darker and even more mysterious than the Fitch, comes into her life. This time around, parts of the story are told from the Red Queen’s point of view. Even more interestingly, whole chapters are told from the point of view of Lily, a woman living in a premigration distopian America. Kelsea becomes prone to falling into trances where she experiences Lily’s life, while her appearance changes so that she begins to look more and more like Lily. A lot of sequels are dull when compared to the novels they come after. For example, “Catching Fire” was almost a repetition of “The Hunger Games”, and “Insurgent” added nothing to “Divergent”. Not this one. In fact, I liked it better than the first one, perhaps due to the science fiction element. A fun, easy read. This entry was posted in books and tagged book, distopia, invasion of the tearling, kelsea, lily, migration, red queen, review, tear, the fitch. Bookmark the permalink.